On an April night in 2006, Darren Flanagan was at home in Nowra when he received a phone call that would irrevocably change his life. An accomplished miner and explosives expert, Darren’s services were requested at the site of a collapsed Tasmanian gold mine. Flying immediately to the site, Darren prepared to help save the lives of two men who were trapped nearly 1km beneath the surface. This was an ordeal that would affect him deeper than he knew. The name Darren Flanagan gained national recognition through his critical role in the Beaconsfield mine disaster. Darren was instrumental, heading far underground and operating more than 70 individual explosives over a period of 30 straight hours. Two weeks after the collapse, the rescue mission was successful (with Darren at the centre of it) and the grateful and exhausted miners walked free. Following this harrowing event, Darren Flanagan realised how tremendously affected he’d been. As he dealt with the pain and trauma of such an ordeal, Darren was moved to share his story with others, shedding a deeper light on what had happened, and looking for ways to communicate the story’s essential message of hope and resilience. 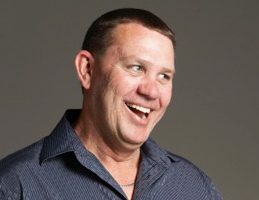 Darren Flanagan now travels throughout Australia as a highly-respected motivational speaker. With the mining disaster at the heart of his presentations, Darren speaks on topics such as risk management, teamwork, mental health, workplace safety, and perseverance. Darren recounts the tale of the rescue itself with raw emotion, bring a level of grit and humanity to the story that is profoundly impacting. Darren Flanagan speaks to businesses, organisations, and groups of all kinds, across all industries. If you’re seeking an authentic and powerfully inspirational speaker, Darren will motivate and encourage your team, sharing lessons and wisdom that will forever transform you.